I'm sure you've heard of the story of Hansel & Gretel; two kids lost in the forest and stumbled upon a cottage made of candy (a la Charlie and the Chocolate Factory style) which belongs to a witch. Fortunately, they managed to escape in the end. Well, Hansel & Gretel are grown ups now and boy did they turn out finnnee..! 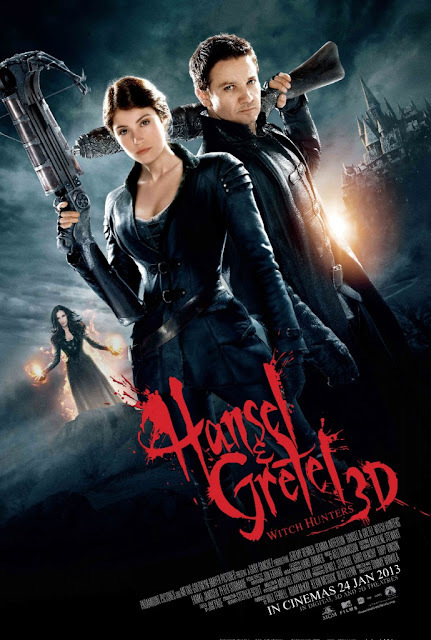 After getting a taste for blood as children, Hansel (Jeremy Renner) and Gretel (Gemma Arterton) have become the ultimate vigilantes, hell bent on retribution. Now, unbeknownst to them, Hansel and Gretel have become the hunted, and must face an evil far greater than witches…their past. The siblings have gone into the business of witch hunting now and strangely, spells & curses do not affect them, which is a great advantage. Now, they've been hired to get rid of a sorceress who plots to sacrifice the children during 'Blood Moon'. Thanks to Nuffnang, I got to watch this last night! If you're expecting a fairytale story, you'll never be so disappointed! This movie is so gory with blood splattering everywhere (imagine that in 3D!). It's no longer about 2 weak & naive children but grown ups who are very much capable of defending themselves. Expect lots of action, fighting, blood and some funny scenes. I wouldn't mind watching this again, especially with that eye candy. Hilarious when the troll said his name is EDWARD and everyone had a flashback of Twilight. At one scene Edward said "trolls serve witches" and walks off. He was referring to Gretel being a witch and he was serving her. Didn't get that one until le bf told me.